This is a study of the Wedmore Estate, 1904. It was the first estate built to let by Islington Borough Council. The story is complicated and very revealing. A century earlier, in 1800, the area was far in the country, well away from the smog and smells of the City of London. At that time the built up area reached only as far as Russell Square: beyond it was still green fields. ‘New Road' running from Paddington to the City. This road, built in 1757, was a new bypass built to allow traffic, cattle and vehicles, to flow from Paddington to the City of London, without going through Piccadilly or Oxford Street. For years the road was the northernmost boundary of London. Today we call the road Marylebone Road, Euston Road, Pentonville Road, and City Road. 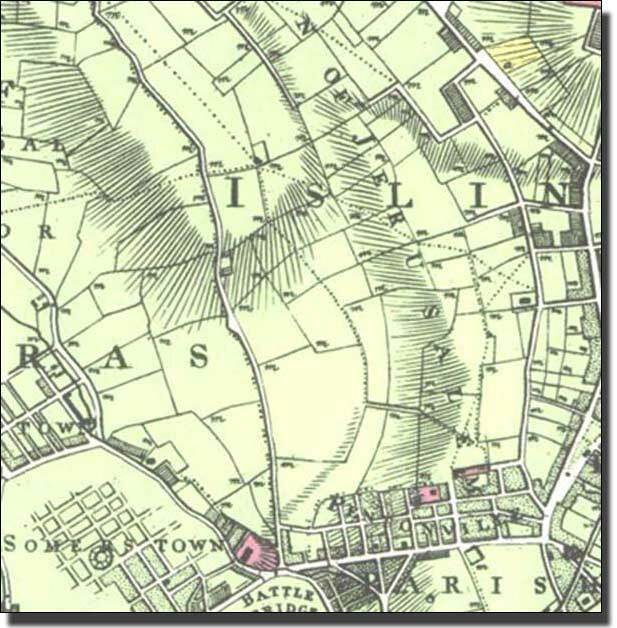 This piece of the map shows Euston Road and the King's Cross area at the bottom, with the green fields of Islington above. The Hollow Way was the low-lying land between the hills of Highbury and Highgate. Only the colours shown above are used in this piece of the map. The full map uses many more colours and symbols for other land uses. The Milne Map of 1800 was one of the very earliest Land Utilisation Maps, shwing how the fields were used in a particular year. 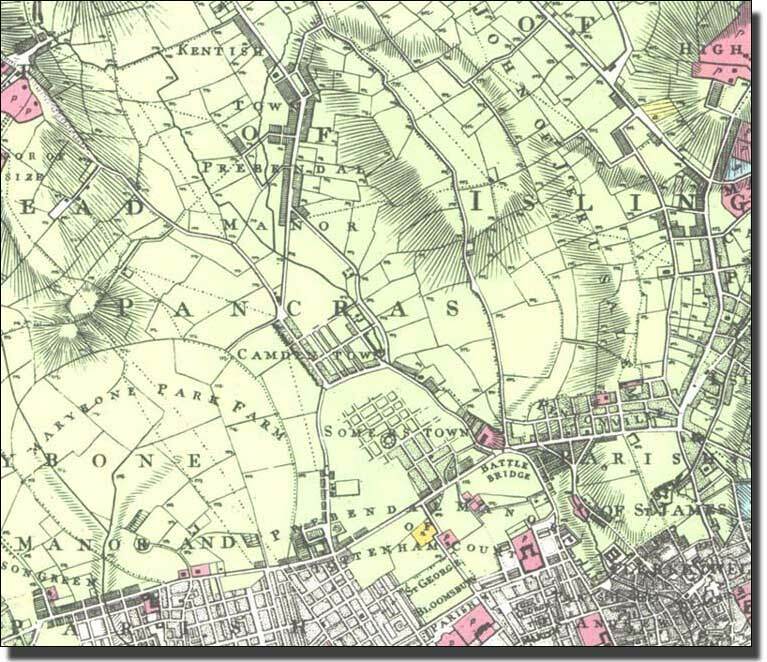 This small section shows the Hollow Way between the hills of Islington, Highbury and Highgate. The hollowness of the area would have been far easier to see then, in the open countryside, than it is today when it is covered with houses. These were two tiny cities of London and Westminster miles away, nestling on the north bank of the Thames, while Holloway was still open meadowland. There were very few houses and almost every field on this piece of the map has an ‘m' in the corner denoting a meadow.The whole area supplied milk, meat, and hay to London and Westminster. 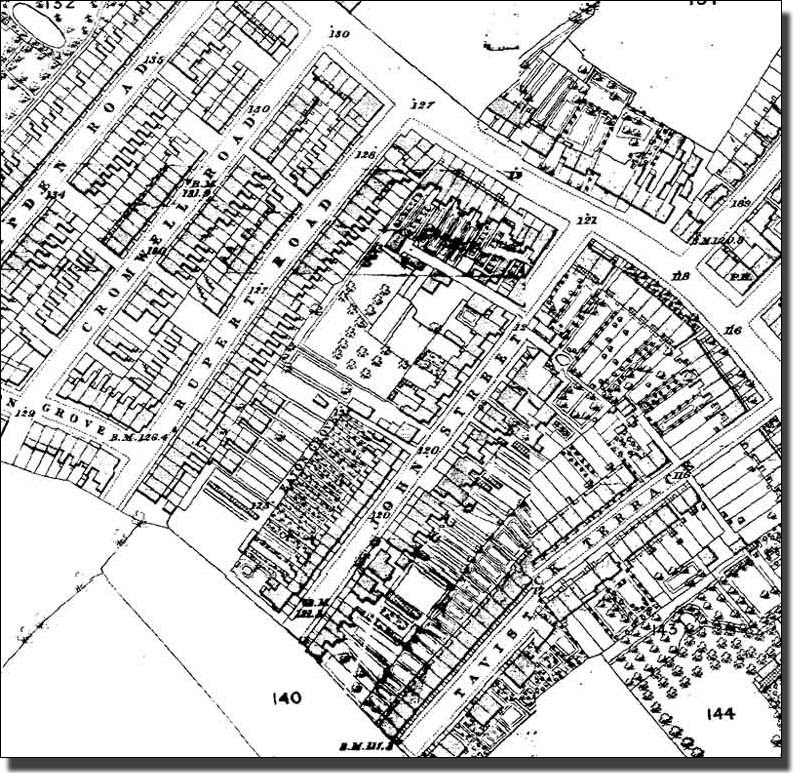 1868 map of the future Wedmore Estate site. By this time the Holloway houses were advancing rapidly. 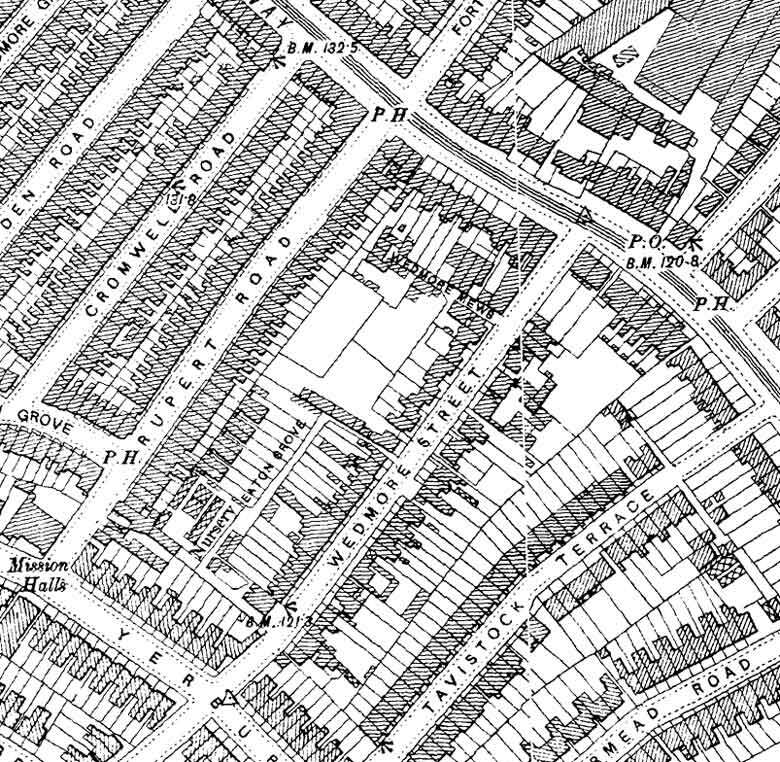 By 1869 there had been building all along Holloway Road and the rest of the fields were numbered as building lots. The fields sone became covered in houses. Most of this new building was good, healthy and with quite large gardens. but London itself was still overcrowded, insanitary and a menace to health. Conditions in some parts were so bad that it was causing outrage and led to the famous Booth Maps of London Poverty. 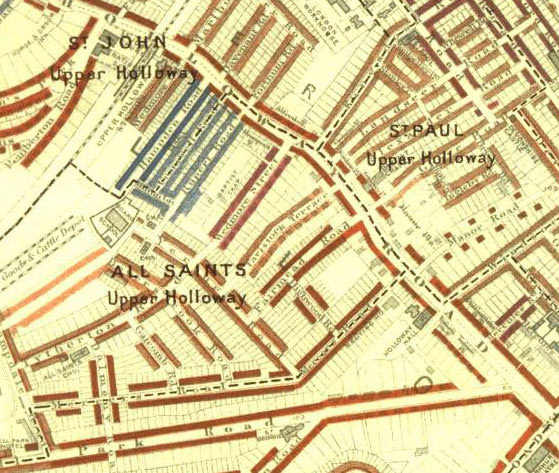 The Upper Holloway section of the section of the Booth shows a mainly prosperous area of Red houses. Along the main roads These ‘Well to do’ families, with one or two servants living in, would have been the owners of factories, solicitors, lawyers, business men, who were moving out of Central London to the countryside. Their families could live in the fresh air, while the father went into the polluted city to make a living each day. The main roads were lined with Red. Around the St Paul’s area there were Pink houses showing Working Class Comfort. Thee were the foremen and skilled craftsmen, what Booth called ‘the non-commissioned officers of the industrial army’. Three roads are in Light Blue – Standard Poverty and Dark Blue – Very Poor. No roads were marked Black – The lowest grade. When the first set of Booth maps were published on 1899 they caused a furore. People were shocked at the scale of the housing problem and how close unhealthy, verminous houses were to their own back doors. People who came into their own houses as workmen and servants, were living in conditions not fit for animals. These were dangerous centres of infection which could affect everyone. Besides concern and pity for others, there was a fear for thir own health. This was a society reading about Pasteur and first learning about how disease is spread and here was danger at their doorsteps. After 17 years and repeated maps, Booth showed that the position was even worst than the radicals had said. The Booth maps had a profound impact on public opinion, partly for humanitarian reasons, but also because the Black and Dark Blue areas of bad housing were scattered among the Yellow, Red and Pink houses of the better-off. People may not have known at that time the full details of microbiological infection, but they knew that filthy conditions nearby might affect the spread of disease and their own health. Enlightened self-interest often informed their charity. Uses of the Booth Poverty Maps in this website. Information for the map was collected by teams of people, including people like the Duckworths (Virginia Woolf’s half brother and half sister) and Beatrice Potter, who married Sidney Web and helped to form the London School of Economics where the Booth files are now housed. Booth’s helpers included some of the most lively and vociferous people in the country. They interviewed the local clergy, police, teachers, and others with particular knowledge of the local areas. One of the main sources of information was the School Board Visitors. Their original qualification had been the ability to run faster than the children, and so catch truants, but they became far more than that. Many of the Visitors worked in the same area for a number of years, so their knowledge of individual families, the fathers’ occupations, family income, etc. was unrivalled. It was their duty to visit every house in every street and make notes on each family with children of school age. They began a few years before the children reached school age and continued until the last child in the family had left. This is stored at London School of Economics and is available on line. It includes 392 note-books of house to house surveys, 55 volumes including records of interviews, and 6 boxes of 25' O. S. maps hand coloured to show degrees of poverty. The seventeen volume survey analyzed this material, but the original notebooks, terse and immediate, are sharp and alive. Quick notes written on the hoof as raw material for more ponderous sentences later, but worth reading in their own right. Some of these interviewers were very astute. Their reports for the immediate areas, which have been published by London School of Economics and are available on their splendid website, make good reading. As London and other cities grew larger, their housing for poor people became a scandal. More and more newcomers tried to squeeze into the limited accommodation. Houses were divided into floors and single rooms. There were cases of whole families living in one room and even of different families living in different corners of a single room. Landlords put up sub-standard buildings over gardens, packed so closely that some rooms had no windows, light, or air. Apart from anything else ,this was a threat to their health and to better--off people living nearby. Earlier legislation had attempted to house the poorer people by charitable and philanthropic means - the so called 'Five per cent. housing' - in which people with charitable intentions invested money in Housing Societies to build property to be rented out at low rents. They did not expect high returns on their money, but they certainly required some. This philanthropic system had rehoused a number of people, but were not large enough or powerful enough to tackle the massive problems revealed by Booth's study of London Housing. Gibson Gardens in Stoke Newington, is one example still standing. It was no coincidence that in 1890, only a year after the first Booth Maps were published, that Parliament became disenchanted with the existing system.. It was clear that 5% Philanthropy could not tackle the massive problems revealed by Booth's study of London Housing, so Parliament gave Local Authorities the right to ‘Build and Let’. This was the start of Municipal Housing. Councils could now build housing in blocks, or as cottages where there was space for them, and let it at low rents to poor people. To do this they could borrow money at low interest over 60 years. This is a very long time. Most people wanted to lend for shorter periods at much higher interest, but this money was safe because it was backed by the government. The money could not be lost unless the government itself went bankrupt, so people were prepared to lend this money at low interest for the sake of security. This cheap, long-term money was the start of Municipal Housing and led to a flurry of activity among Local Authorities. The problem now was to find cheap building sites in city centres within easy distance of people’s work. Well off people wanted to move to the edge of town, so land prices were high there. Good sites in the centre were far too expensive for Councils to buy. The patch of Blue in Upper Holloway consisted of old, overcrowded and unhealthy properties already occupied by people who could afford no better. The Council began to buy up these houses in bits and pieces and gradually put together a possible site. By this time almost there had been a lot of building and the remaining fields were set out as building lots. 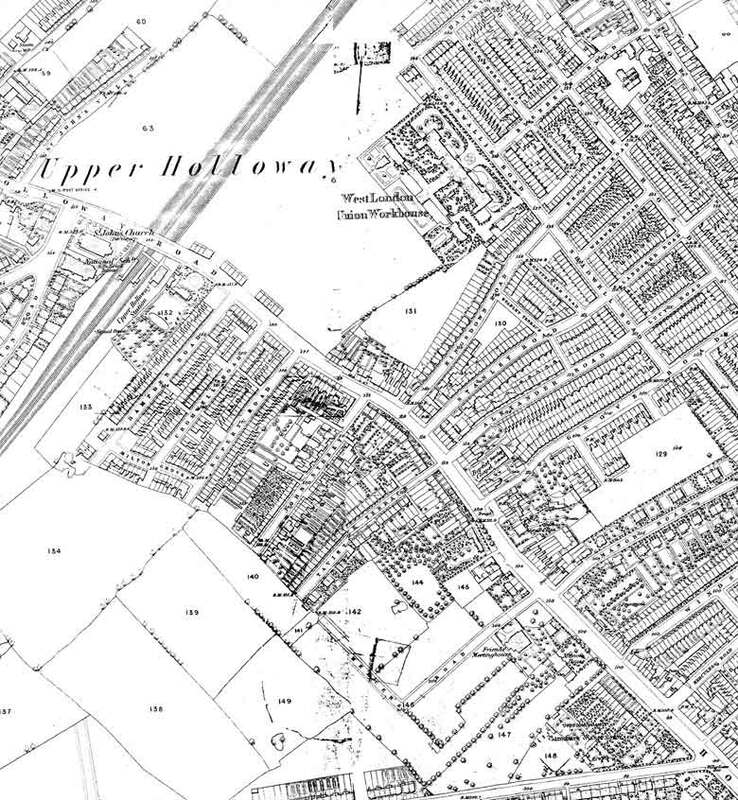 The London County Council searched for a long time and it was 10 years before they found the first Holloway site. The area was adjoining an area of Poverty, marked in blue on the Booth map above. This file is an example of how the L.C.C. tackled its new responsibility. 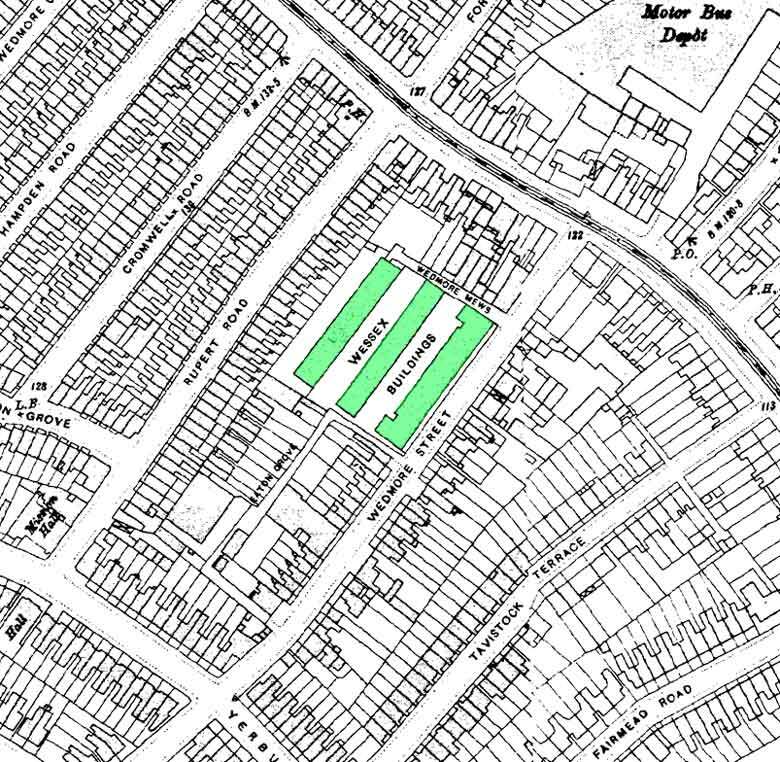 On 11th December 1900, the London County Council decided to purchase a site in Wedmore Street, Holloway, under Part III of The Housing of the Working Classes Act, 1890. The flrst houses mentioned in the minutes were the odd numbers from 39 to 47, but clearly the Council had plans to buy more than these few. The total sum available for the site and for the three blocks of dwellings to be built on it, was £62.460. By April.1901 the site had been purchased and the freehold was obtained in May, for a total sum of £11,650. Work proceeded and in December 1902 the Council was offered two more houses, Nos 40 and 51, by W. J. Ramsay & Co, of the Phoenix Estate Office, 457 Holloway Road. The Architect prepared a plan for the Nos 39 - 47 site and one for a larger site which would be made possible if the two extra houses were purchased and included in the scheme. In the second case, 296 persons could be accommodated. In November the Council voted £250 for preliminary site work, including making trial holes to examine the subsoil. In January 1903, the Council reported that they had made an ex-gratia payment of £5 to the tenant; of No 2 Wedmore Street for giving them vacant possession. Ramsay & Co now offered Nos, 11-17 (odd). Gradually the council was accumulating a larger site. These details have been added to show how carefully the Local Authoity had to be with its financing, planning years ahead, and to illustrate how prices have change in more than a century. The estimate for the Back Block of Wessex buildings, now called Melchester, were as follows. carefully the Council had to control its present and future spending. In February 1903, the Valuer's original calculations had to be altered because the District Rates had been increased from 6 shillings in the pound to 7 shillings and two pence halfpenny, and lncome Tax had risen from 1 shilling. to 1 shilling and 3 pence. in the pound. These rises would have put up the necessary rents. On the other hand, the improved standard of building which the Architect was proposing would reduce the costs of future repairs. All the internal woodwork was to be grained and varnished instead of painted. This would require complete revarnishing only twice in the whole sixty years which the building would take to pay for, and mere washing and touching up in between. All door and window furniture would be substantial and long lasting; sash windows, not casements, were to be used; the stair­cases to the blocks would have a dado of glazed brick and the outside of the building itself, would have a glazed dado to a height of four feet with all angles finished with bull nosed bricks for safety. Because of the expected reduction in maintenace, the estimate ref expenditure on repairs and renewals could be reduced from 13% to 10%. How Changes in Finance affected the whole project. The Housing of the Working Classes Act, Part III, provided that no charge should be placed on the county rate, so extra costs could not be passed on. In 1890, the Council had calculated that, with interest at 3%, there would be. a modest, annual surplus of £47. 16. 8d. By 1903 interest had risen to 3 ¼ % which would turn this surplus into a deficit. of £53, 13s. 4d. This could be met by saving in construction, but the rise in interest and income tax rate. and in the District Rates, was to reduce the total. amount. available for the project from £62, 460 to £60, 987. About £1,500 had been lopped off' the project by events totally outside the control of the L. C. C. or the Arcitect. This is a very simple example of what happens to projects all. the time and which, in many cases, can lead to bankruptcy. Local Authorities had to plan and look far ahead in financing these blocks. Every penny had to be accounted for years ahead. In January 1904, Nos 2-18 Wedmore Street were demolished, in preparation for the Third Block. The necessary shoring and boarding work was carried out by the Council for £59, 10s. 6d. but the sale of old materials for £47, 3s. 6d. almostpaid for it: (This illustrates how closely the figures were checked). This gave a total rental income of £1,3200 16s, less any losses on empty properties etc. Interest was at 3½ % by this time, while interest on the Sinking Fund was at 2½%. In July the Finance Committee was still considering what: to do about funding the building. The 1900 calculations were out of date. Interest had risen in 1901 to 3¼ %, to 3½ % in 1903, and 1904. This gave an annual deficiency of £60. 1s. 11d. on the Back Block alone and £108 on the three together. The Sinking Fund, formed by setting aside income from the rents to accumulate at interest to pay off the cost of the building, was invested at 2½ %. If the Sinking Fund could be invested at 3% instead, the estimated annual deficiency would be reduced to about £60. The Finance Committee considered appealing to the Treasury for permission to do this. The records do not show if they were successful. By October 1904 the front two blocks were nearing completion and would provide accommodation for 710 persons. The third block, which would house 340, was to be built in a different manner. The increase of interest rate had affected the amount available so that only £15.037 could be spent. The Committee decided that the Third Block should be erected at the prices adopted for the earlier ones, but 'without the intervention of a contractor', which means by direct labour, in order to to save the Contractor's profit. On 18th July 1904, an amendment, to reverse this decision and to have the work, done by private contractors, was defeated by 75 votes to 44.Clearly this had become apolitical issue between left and right on the Council. This very detailed account of how the first Islington blocks were built, reveals how each contract has its own running problems and how outside influences impact on any actual building. It shows why ‘an architect has to have two pairs of eyes and wings on his feet' if he is to bring a building to a successful conclusion.